9 Holes Short course measuring 831 yards/756 metres. 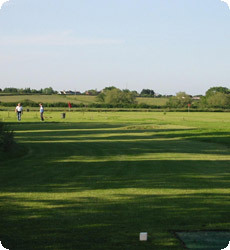 Longest hole 104 yards/95 metres shortest 73 yards/ 67 metres. A good test for an beginner and a great way for the more experienced golfer to hone those very important short game skills. Golf lessons are available from Mike Steadman. A PGA professional for 40 years who has sat on various PGA committee’s, currently Treasure of the Somerset Schools Golf Partnership.